The decorative look of Bourbon Balls makes them a festive addition to any Christmas tray. Bourbon Balls are a sweet and chewy, no-bake confection made from a combination of finely crushed cookies (traditionally vanilla wafers), confectioners sugar, unsweetened cocoa powder, chopped pecans or walnuts, held together with a little corn syrup and bourbon. It's easy to like Bourbon Balls since they taste great, they are quick and easy to make, and they only improve with age. Essentially Bourbon Balls and Rum Balls are twins, the only difference being the alcohol. Did you know that in 1964 the U.S. Congress declared bourbon to be "America's Native Spirit"? Bourbon is an American whisky made primarily from corn and it is named after Bourbon County, Kentucky. Although bourbon can be made anywhere in the United States, only bourbon from the state of Kentucky is allowed to have its' name of origin printed on its' label. Now Bourbon Balls will only taste as good as the bourbon you use, so if you wouldn't drink it on its own, don't use it. There are a few ways to maximize the flavor of these little gems. First, I recommend toasting the pecans to bring out their wonderful flavor. But don't feel you have to use pecans, for walnuts, hazelnuts, or almonds also make excellent bourbon balls. And while many recipes call for finely crushed vanilla wafers, other favorites are graham cracker crumbs or you might like to try using crushed digestive cookies, shortbread cookies, ginger cookies, or even chocolate wafers. You can use either natural unsweetened or Dutch-processed cocoa powder. Also corn syrup is a thick, sweet syrup made from cornstarch that is available both clear (light) and brown (dark). It is sold in glass or plastic bottles. If you cannot find light corn syrup than golden syrup or liquid glucose syrup can be used in this recipe. If you find that after mixing the ingredients the batter is quite sticky, chill it for about 30 minutes. While I often just roll the cookies in powdered sugar, you could also roll them in granulated white sugar, cocoa powder, chopped nuts, candy sprinkles, or they can even be dipped in melted chocolate. Bourbon Balls really taste better if stored for at least a day or two so their flavors have time to mingle and soften. Make sure to store the bourbon balls in a covered container in the refrigerator but bring them to room temperature before serving. 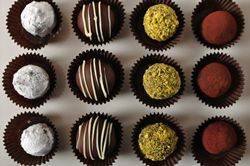 Bourbon Balls: To toast nuts: Preheat oven to 350 degrees F (180 degrees C). Place the pecans on a baking sheet and bake for about 6-8 minutes, or until lightly browned and fragrant. Let cool completely. Process the pecans and vanilla wafer cookies in your food processor until finely chopped. To this mixture add the confectioners sugar and cocoa powder and process until combined. Add the corn syrup and bourbon and mix well. Add more bourbon if necessary. Chill the batter and then shape into 1 inch (2.5 cm) balls. Roll the bourbon balls in confectioners sugar, finely chopped nuts, or cocoa powder. If dipping in chocolate, put about 3 ounces (90 grams) of chopped dark chocolate and 1 teaspoon (5 grams) of shortening or butter in a heatproof bowl placed over a saucepan of simmering water. Once melted, remove from heat and dip the balls, one at a time, in the melted chocolate, making sure the entire ball is coated with chocolate. Then, with two spoons or a dipping fork, remove the bourbon balls from the melted chocolate, allowing any excess chocolate to drip back into the bowl. Place the chocolate covered balls on a baking sheet. When all the balls have been dipped in the chocolate, place in the refrigerator until the chocolate has set. Once the chocolate has hardened you can drizzle the bourbon balls with 1 ounce (30 grams) melted white chocolate. Can be stored in an airtight container in the refrigerator for about two weeks. Serve at room temperature. Makes about 30 Bourbon Balls. Preparation time 30 minutes.